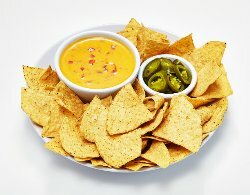 a bowl of rotel cheese sauce served with tortilla chips & a side of jalapeno peppers. piping hot soup served in our fresh baked bread bowl - see menu board for todays soup. 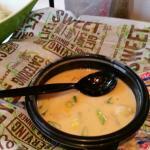 an 8 oz serving of our soup of the day. a fresh baked bread bowl filled with our made from scratch chili topped with grated cheddar & monterey jack. rotel cheese sauce, salsa, jalapeno peppers, sour cream & a large order of tortilla chips. mixed baby greens, grilled & chilled chicken breast, seedless grapes, granny smith apples, candied pecans, celery & gorgonzola cheese tossed with a balsamic vinaigrette. 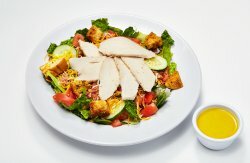 fresh greens, cucumbers, tomatoes, crisp bacon, cheddar & monterey jack cheeses topped with tender, juicy chicken breast & homemade croutons. fresh greens, cucumbers, tomatoes, ham, turkey, grated cheddar & monterey jack, homemade croutons & a salad pepper. layers of crisp lettuce, tomatoes, chili, tortilla chips, topped with grated cheddar & monterey jack cheeses, sour cream, jalapeno peppers & black olives - served with a side of fresh salsa. a fresh baked bread bowl filled with the soup of the day, served with your choice of a small garden or caesar salad. grilled chicken breast on fresh romaine, homemade croutons, sun-dried tomatoes & grated parmesan cheese. grilled chicken breast strips, fresh mixed greens, juicy oranges, scallions, carrots, red & yellow bell peppers & water chestnuts tossed with fat-free oriental vinaigrette. Served On A Bed Of Crisp Greens With Crunchy Cucumbers, Ripe Tomatoes & Your Choice Of Dressing..
our own recipe, made fresh using all white meat chicken, eggs, red seedless grapes & chopped pecans. fresh homemade shrimp salad made with red & yellow peppers, celery & green onions. fresh albacore tuna salad made daily with chopped pecans & sweet relish. peppers recipe, made fresh daily with all white meat chicken, eggs, red seedless grapes & chopped pecans. homemade shrimp salad served on a flaky croissant with spring greens, sliced tomato & red onion. peppers recipe, made fresh daily with albacore tuna, sweet pickle relish & chopped pecans. piles of hickory smoked ham & crispy bacon, topped with smoked cheddar cheese. layers of roast beef, turkey & ham, topped with your choice of cheese. piles of thinly sliced ham & genoa salami, fresh olive salad, smothered in provolone cheese, served on muffaletta bread. 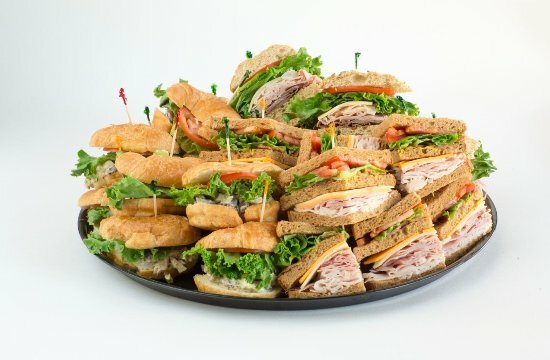 layers of deli sliced smoked turkey, lean & crispy bacon topped with melted cheddar cheese. * Grilled Chicken Breast Sandwichfavorite! grilled chicken breast topped with swiss cheese, mayo, peppers honey mustard dressing, lettuce & tomatoes on your choice of bread. tender roast beef, roasted peppers & onions, topped with monterey jack cheese, served with au jus. crisp bacon, iceberg lettuce & tomato slices with mayo. tender roast beef, kielbasa, spicy jalapeno pepper cheese & bbq sauce with your choice of toppings. ham, turkey, crisp bacon, cheddar & monterey jack cheese, green onions & black olives, with a side of butter & sour cream. loaded with crispy bacon then smothered with cheddar & monterey jack, served with a side of butter & sour cream. cajun spiced shrimp, melted cheddar, monterey jack cheese, red onion & scallions stuffed into a potato. baked potato smothered with cheddar & monterey jack cheese, served with a side of butter & sour cream. fat free butter & sour cream available upon request. thinly shaved turkey, ham, cheddar & jack cheeses, crisp bacon, lettuce & tomatoes with peppers honey mustard dressing. 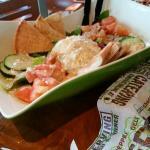 cajun spiced shrimp wrapped in a flour tortilla with lettuce, cabbage, pico de gallo & chipotle ranch dressing. grilled chicken, lettuce, tomatoes, cheddar & jack cheeses, corn, black beans, ranch & bbq sauce. served with tortilla chips & fresh salsa. a french loaf with sliced turkey breast & ham, pickle slices, dijon mayo & melted swiss, with your choice of side item. 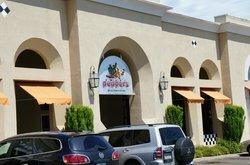 grilled ciabatta bread with ham, pepperoni & salami, topped with provolone, red bell pepper, pepperoncini, tomato & italian dressing with your choice of side. 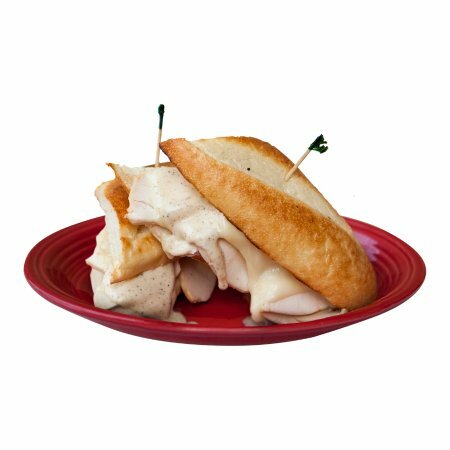 sliced chicken tossed in greek dressing, genoa salami, pepperoni & provolone cheese on ciabatta with your choice of side item. sliced roast beef with horseradish spread, roasted bell peppers & onions, provolone on whole wheat ciabatta with your choice of side item. tender corned beef on pumpernickel rye bread, sauerkraut, melted swiss & 1000 island dressing, with your choice of side item. 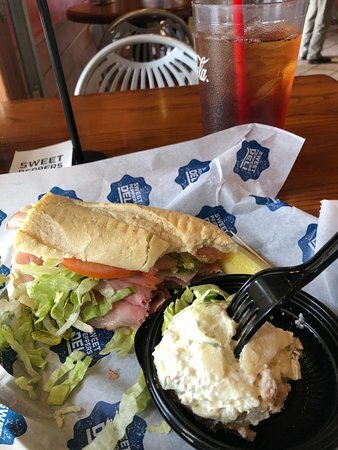 Lite Line Sandwiches & Wraps Are Served With A Pickle Spear & Your Choice Of Side Item. roasted turkey breast, fresh avocado, sun-dried tomatoes, spring greens, cucumber & fat-free sun-dried tomato basil vinaigrette on toasted whole wheat. baked bbq shrimp, sweet corn, avocado, black beans, red onion, scallions, lettuce & fat-free ranch dressing wrapped in a whole wheat flour tortilla, grilled crisp. shaved roast beef with horseradish spread & provolone cheese, smothered with roasted peppers & onions on whole wheat ciabatta bread. 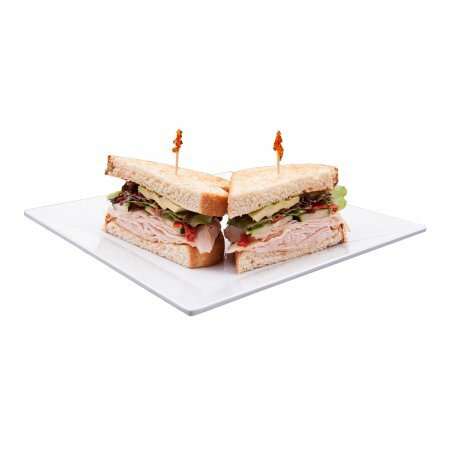 layers of deli sliced, smoked turkey with fat-free mayo, guldens mustard, shredded lettuce, tomato & red onion on toasted wheat bread. red & yellow peppers, julienne lettuce, scallions, water chestnuts, fresh oranges & carrots tossed in fat-free oriental vinaigrette, wrapped in a whole wheat tortilla, grilled crisp. fresh greens, tomatoes, cucumbers, red & yellow bell peppers served with homemade fat-free ranch dressing. piles of thinly sliced turkey, bacon, lettuce, tomato, avocado, smoked cheddar & chipotle ranch dressing served on sun-dried tomato basil bread. turkey, ham, cheddar & swiss, bacon, lettuce, tomatoes, mayo & peppers honey mustard dressing on toasted wheat bread. 最近的午餐就吃的甜辣椒一个熟食店和吃得津津有味的。 面包很美味也很新鲜和鸡肉沙拉很特别。 我的朋友选择了华尔道夫沙拉也非常好。 我们坐在露台上,尽管很热这是密西西比的餐厅里面很冷。 所以我们就有阴凉的露台都是能让人忍受的。 还会再来的!